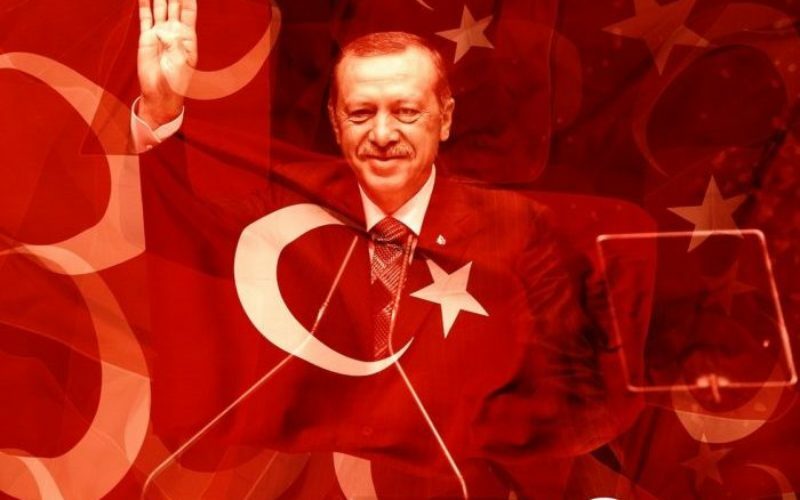 One obvious reason behind Erdogan’s appeal and power is the widespread fear of mass arrests, as the Justice and Development Party (AKP) has ruled under emergency powers since the failed coup attempt. According to Human Rights Watch, more than 110,000 people have been detained in the post-coup crackdown, including 28,000 teachers and 2,200 judges alleged to be Gülen supporters. Under martial law, the government has passed many decrees extending its legal powers, including the confiscation of property without judicial review, police custody of up to 30 days, and the denial of access to a lawyer in certain cases. Moreover, the government has gone to great lengths to limit freedom of expression and the media. According to a recent report released by the Committee to Protect Journalists, the AKP has jailed 73 journalists. Dozens more still face trial after being charged with anti-state crimes. However, fear of arbitrary arrest is not the only factor explaining Erdogan’s unrivaled popularity. Last month’s survey results from Risk Pulse surveys, a new approach to measuring political instability by Dalia Research, showed that 46 percent of Turks approve Erdogan’s job performance. Only 26 percent expressed their disapproval of the president and 28 percent neither approved or disapproved. Data also indicates high support for the AKP as well as Erdogan’s strong leadership style. Notably, 47 percent of the respondents are generally in favor of a strong leader without institutional constraints, whereas only 26 percent are against the idea of a president with extended powers. Last April’s referendum reflected a country sharply divided. A little more than 51 percent of Turks voted in favor of the executive presidency, with a turnout of over 85 percent. While Turkish major cities have opposed the several amendments introduced by the reform, generally more religious and conservative rural voters, were in favor of them. For the first time, Erdogan lost the majority in the country’s largest cities.Turkey’s western coastal regions and its urban centers voted firmly against the reform. In Istanbul –the city where the president started his political career and was elected mayor in 1994 — 51.4 percent voted “No,” while that figure was 51.1 percent in the capital, Ankara. In the Aegean coastal city of Izmir, 68.8 percent of the voters opposed the reform project. In contrast, the Anatolian heartland voted overwhelmingly for Erdogan’s proposed changes, highlighting the emergence of an urban-rural divide. The deep divisions within the Turkish society, namely Secularists versus Islamists, liberals versus conservatives and Turkish nationalists versus Kurdish nationalists, played a crucial role in the Yes vote’s victory. They can also provide an explanation with regard to Erdogan’s popularity. For the majority of Turkey’s rural electorate (with the exception of the Kurdish southeast, also largely rural, which opposed the referendum), Erdogan embodies political stability, religious freedom and a more than a decade of economic success. Under the rule of the AKP, Turkey moved from “assertive secularism,” where religion is banned from the public sphere and is limited to a private affair, to “passive secularism,” where the state assumes a passive role in accommodating the public visibility of the religion. A spate of laws was passed to increase space for Islam in public life, which included the opening of new religious schools; the removal of restrictions on Islamic head scarves for women in universities, the army and the civil service; the improve of opportunities for graduates of the Islamic Imam-Hatip schools; and the expansion of the teaching of the Quran. Furthermore, Erdogan is also perceived as one of the few successful Turkish politicians in terms of expanding the rights of Christian and Jewish associations – for instance, in helping them to recover properties that had previously been confiscated. For a large, pious section of the population, Erdogan represents a defender against the assertive secularism that had been dominant in Turkey throughout most of the 20th century. Erdogan has also brought significant material gain to much of the country. Since the AKP came to power in the general elections of 2002, Turkey’s economy has grown considerably. Until the 2016 failed coup, economic development was the basis of both socio-political stability inside the country and of the pro-EU foreign policy agenda pursued by Erdogan. Between 2002 and 2007, Turkey’s economy grew at annual rate of 7.2 percent. The country even performed well throughout the global financial crisis: after a slowdown in gross domestic product (GDP) growth to just 0.6 percent in 2008, the economy picked up again in 2010, producing an impressive 9.2 percent growth in 2011. Since Erdogan became prime minister in 2003, average incomes have risen from $3,800 to around $10,000 as of 2017 according to World Bank data. Hence, the AKP rule saw the number of people living below the poverty line dropped from 23% of the population to less than 2%. Over the last two decades, Turkey has significantly improved people’s material well-being with the implementation of a well-designed welfare safety net. According to datacollected by the Organization for Economic Cooperation and Development (OECD), public social spending as a percentage of GDP climbed to 13.5 percent in 2014, compared to 7.7 percent in 2000. One of the major reforms carried out by the AKP government has been the creation of a general healthcare insurance system that covers both citizens and foreign residents in the country. The government also provided colossal amounts of money for the renovation of public hospitals and the establishment of an individual pension system. Many worry that all these social and economic advances will be reversed if Erdogan leaves office, reversing the country’s drift towards passive secularism buoyed by welfare policies and improvements in people’s living standards. Will this relative popularity be enough for Erdogan and the AKP to win the 2019 municipal, parliamentary and presidential elections? According to Dalia Research, if Turkey was to hold presidential election tomorrow, the AKP would come in first with 36 percent of the vote, followed by the Republican People’s Party (CHP), which would receive 12 percent of the vote. This would prevent Erdogan from reaching the 50 percent threshold for victory in the first round. The data fuels concerns within the AKP to that the president will eventually be defeated, especially if Abdullah Gul, a former president and co-founder of the AKP, decides to run. Former Minister of the Interior and vice-speaker of the parliament Meral Aksener, Turkey’s ‘Iron Lady,’ also looms on Erdogan’s political horizon. After breaking away from the right-wing Nationalist Action Party (MHP), she formed the Good Party (IP) and is determined to capture the conservative vote in the 2019 presidential election. In this way, the March 2019 municipal elections may act as a prelude to difficult presidential and parliamentary elections the following November. Erdogan has launched a vast rejuvenation operation in view of the municipal elections, sidelining both long-standing Istanbul and Ankara mayors in what was seen as a show of force. Since the president’s political future depends on clear victories in all three elections, the government is likely to intensify the repression against political opponents, critics and other perceived enemies of the state. However, the AKP’s focus on domestic power struggles and foreign policy challenges is not without risks, as it will block the economic reforms needed to improve the business and investment climate. Political instability and fluctuations in global liquidity, a result of anticipated shifts in US monetary policy, domestic policies, and geopolitical tensions the Middle East present potential risk to foreign capital inflows to Turkey. These inflows are crucial to Turkey’s large external financing requirements. he shift in capital flows has put the lira under severe pressure since late 2016, causing inflation to rise. Polling results from Dalia Research suggest that the increase in prices has already impacted a large spectrum of the Turkish population: 73 percent of the respondents believe the gap between the rich and poor has increased over the past 12 months, and 78 percent declare feeling angry regarding the increase in wealth inequality. If faced with social discontent following the acceleration of inflation, the Central Bank of Turkey will be under considerable political pressure to not raise interests further, and will therefore be constrained in its ability to tighten monetary policy. In the event of another severe weakening of the lira, an abrupt tightening of policy, may be necessary. Such a scenario could strangle Turkey’s economic recovery and cost Erdogan a large part of his political base.